DALLAS and GRAND PRAIRIE, TEXAS ––September 9, 2014––Kannuu Pty Ltd, a leading provider of search and discovery solutions for video content across multiple services and devices including Smart TVs, tablets and smartphones, and FYI Television, Inc. (FYI), the premier television listings metadata and rich media content provider, today announced their strategic relationship. 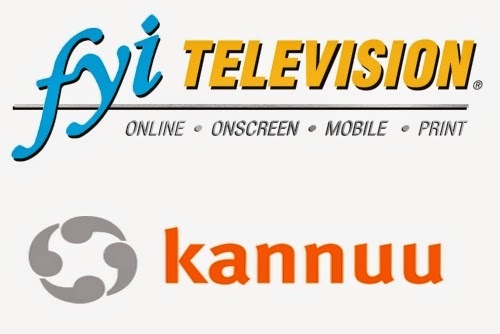 Kannuu will incorporate FYI’s TV listings and electronic program guide (EPG) knowledge into Kannuu’s ‘findability enabled’ search and discovery platform, further empowering Kannuu’s breakthrough ‘letter grid free’ direct search, tablet to TV pair-and-share technology, and advanced, cloud-based personalization and recommendation capabilities. The combined Kannuu / FYI offering enables multi-systems operators (MSOs) to dramatically elevate their search and discovery capabilities through enhanced recommendations and search technologies tailored to the MSO’s consumer base. Combining superior recommendations with high-integrity EPG and metadata content establishes the foundation for a superior discovery experience. Next-generation search and discovery experiences such as those provided by Kannuu and FYI are a must have for service providers striving to drive customer loyalty and increased spend. “We are thrilled to provide Kannuu with first class television content. Together, we will connect consumers with the most relevant, well-rounded television information and rich media, allowing them to make more informed viewing choices,” said Chris Stark, Sr., President and CEO of FYI. Kannuu provides cutting-edge search, discovery and findability solutions for quickly finding video content in today’s multi-screen environment. Combining sophisticated delivery infrastructure, advanced search algorithms, proprietary recommendation techniques, flexible business rules and unique and intuitive user interfaces, Kannuu enables device manufacturers, service providers, software companies and application developers to maximize the full value of video content. By providing a fast, easy and vastly superior user experience, Kannuu satisfies consumers and drives revenue for service suppliers. Kannuu customers include Western Digital, REELZCHANNEL TV, and Telstra, Australia’s leading telecommunications and information services company. The Kannuu technology for video search and discovery across services is also available on the Samsung and LG Smart TV platforms for proprietary implementations. For more on Kannuu, visit http://www.kannuu.com.